German Chancellor Angela Merkel and Nigeria's President Muhammadu Buhari address a news conference at the presidential villa in Abuja, Nigeria, Aug. 31, 2018. 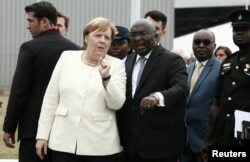 German Chancellor Angela Merkel wrapped up a tour of three African nations Friday. She said her goals during the visit were two-fold: to promote business ties with Germany and to curb the wave of migration from the continent to Europe. But Merkel faces many other issues on the continent, analysts say: the rise of China, the declining image of the United States, and a still-festering wound in Namibia over Germany's actions in that country more than 100 years ago. Analyst Jakkie Cilliers of the Pretoria-based Institute for Security Studies notes that Merkel's trip follows recent visits by French President Emmanuel Macron and British Prime Minister Theresa May. "So, in one sense, one could make the argument that Merkel is playing catch-up," he told VOA. "But I actually think these [visits] reflect, to a large degree, real concerns in Germany about migration and, of course, radicalism and radical terrorism in West Africa." FILE - German Chancellor Angela Merkel is welcomed by Ghana's Vice President Bawumia at the Jubilee Airport in Accra, Ghana, Aug. 30, 2018. Merkel's tour included stops in three of West Africa's most vibrant economies: Senegal, Ghana and Nigeria. Nearly a dozen German CEOs keen on promoting business ties accompanied Merkel on her trip. Cilliers also says that Merkel may be trying to fill a vacuum created by what he described as a "faltering" of U.S. leadership in the last two years. "Africa is, in my view, an important pivot, a battleground in a certain way, about the future of rules-based order at a time when American leadership clearly is faltering," he said. "So you can, in that context, make the argument that to a degree perhaps, Angela Merkel is partly stepping into the vacuum that has been left by the U.S. retreat." Merkel's tour coincided with a major development in Berlin. Earlier this week, her government handed over the remains of indigenous Namibians killed by German forces in the early 1900s. German troops are believed have killed tens of thousands of indigenous Herero and Nama people after they revolted against colonial rule. Vekuii Rukoro is the elected chief of the Herero people, who number about 400,000, and he attended the ceremony in Berlin. He says he welcomed the gesture. "We feel happy that after more than 114 years we were able to bring back these remains, back home to the land of their ancestors, and reunite them with the spirits of the ancestors," he told VOA. But, he says, it's not enough. His group is suing the German government in U.S. District Court in New York — which is home to a large concentration of expatriate Hereros — seeking an apology and group reparations. Until Germany does more, he says, he sees no point in a visit from Germany's chancellor. "What would she come and do," he said, "in the absence of them having acknowledged genocide, them having even issued an appropriate apology?"